NRIs have access to the whole world & that’s the reason question is why should NRI invest in India? If Yes. Where & How to invest is another major challenge. The GDP growth rate for India for the quarter ended November 2018 was 7.1%. Swedish furniture giant IKEA, which recently opened a store in India plans to open 25 stores over the next few years. Reliance Industries is planning to make a big entry into the online retail business in India. These facts suggest that India continues to be an attractive destination for investment. As an NRI, you should take advantage of the growth in India. A report by the Boston Consulting Group says that consumption in India will be triple of that in 2018 by 2025. India is set to overtake UK and become the fifth largest economy in the world. As you can see, the Indian economy is expanding. This means companies, banks and the markets have the potential to do well. Therefore it makes sense to invest in Indian markets. More than 65% of the population in India is below the age of 35. This segment has consumerist aspirations and higher propensity to spend. They have a higher disposable income which they will use to improve their lifestyle. This will lead to increased revenues for companies. 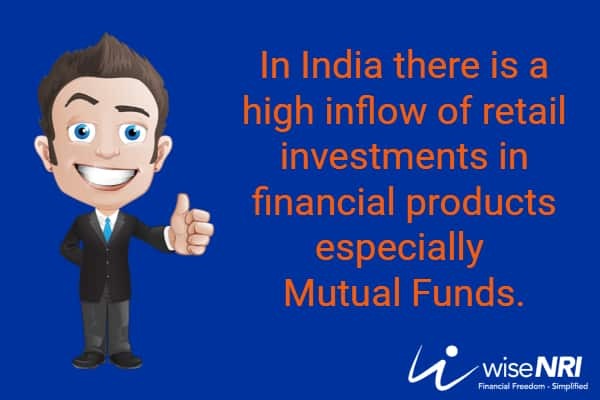 Moreover, they are aware of investing and therefore there is a high inflow of retail investments in financial products especially mutual funds. This means our markets have the potential to do well. There will be more steps to streamline markets and financial products. Big brands like IKEA and H&M have started operations in India. Netflix is spending massive amounts on marketing in India. They must have done some research and analysis and seen some potential in India before committing huge funds in the country. NRIs can follow their suit to create wealth for themselves. The consumer base in India is growing by leaps and bounds. India is expected to be the third largest consumer market by 2025. Per capita income is on a rising trend which means expenditure on health, education, communication, transport, food, and entertainment will increase for the next few years. The consumption for goods in rural India is also rising. The Indian middle class which is increasing in numbers loves to buy which means companies can target these different segments aggressively. NRIs should not miss this growth story and invest in India such that they reap benefits too. All the economic indicators have been showing the right signals. Inflation has come down. The interest rates on FDs have gone up. The equity markets and mutual funds in India have performed better than of most countries in the last few years. Although past performance cannot guarantee future performance, there are no events that have altered the fundamentals in India, so one can reasonably expect for things to go on as they have been going on. So India is a good destination for investment and NRIs should take advantage of the same. On the other side, net FII inflows have been negative. The Indian currency has taken a beating over the last year and there is an increase in the unemployment rate. But given the steps taken by the government to make India business friendly and the rapidly growing consumer base, we can conclude that the India growth story is still intact provided there are no untoward events or incidents that shake up the Indian economy or the global economy. Therefore, NRIs should make an investment plan to allocate some of their funds to the India growth story. Equity Investments – NRIs can invest in direct equity by linking a demat account to their NRE/ NRO account. They have to research and analyse the stocks thoroughly before investing as there is an element of risk involved. Alternatively, mutual funds are the best way to invest money in India for NRI & participate in Indian growth story. Real Estate – NRIs can invest in residential and commercial real estate. It is important to understand all aspects of the project one is investing in. Be sure to invest in properties of reputed builders or brands. You can take a bank loan to invest so that there is additional levels of vetting. It is important that either you or someone you trust is present physically to close the deal and also take care of the property. Government Securities/Bonds and Certificate of Deposits – There are many debt options for NRIs to invest in. These offer low risk but optimum returns. How do NRIs invest in India? Normally it’s through their banks. But be frank it’s the worst way as most bankers abuse the trust of NRIs. 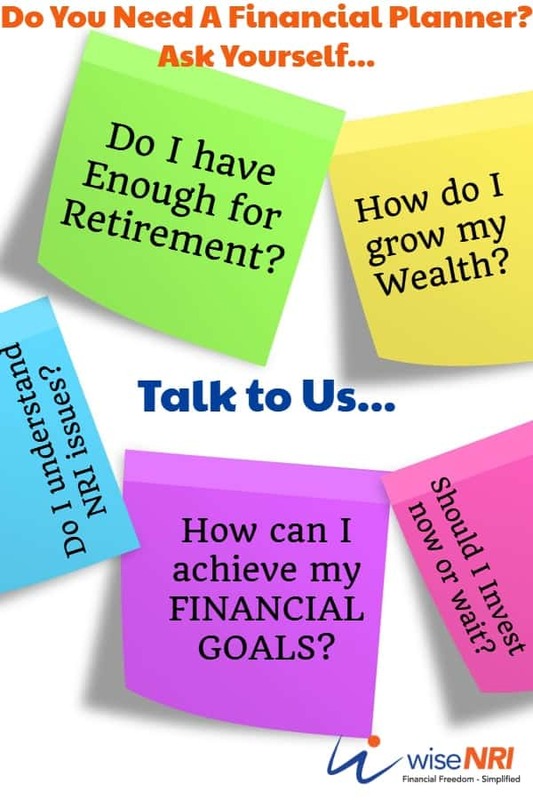 You should hire a good financial planner who understands the needs of NRIs & can guide you towards your goals. 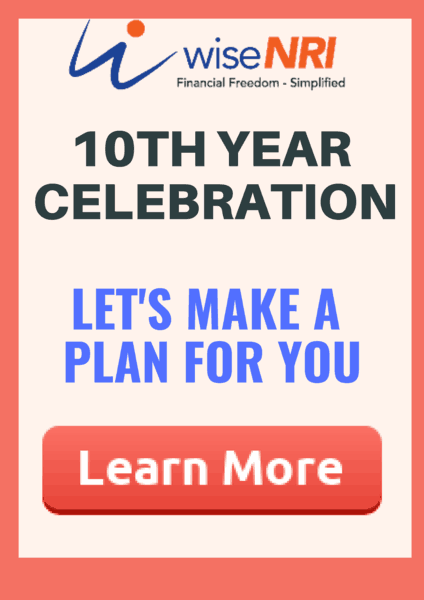 Looking for a Comprehensive Financial Planning Solution? Hope this post removed your confusion regarding – Should NRI Invest in India? If you still have any questions regarding NRI investment – feel free to add that in the comment section. Is a NRE FD a better investments instrument than Mutual Funds (Equity/Debt combination (50:50)) for a investment time horizon of 7 years? Thanks for sharing your views Mr seetharama.